Find out about a secret that every successful person has in common yet most don't realise its importance. This secret is the key to every success and even more everything else that there is. It can give you great wealth or success on any field you wish but furthermore it can set you absolutely free. It came to me when I just worked up another one of those very stressful and tragic years that I have been through in my life. After several weeks of lonely days and nights, going over all the things that happend in my life the last years and wondering, "Why?". I was looking for the reason for all this and a meaning of life, trying to find myself again. That was exactly the time when this knowledge 'was given to me', as I like to say. It suddenly came to me, this Divine Truth; not believing it wasn't even possible as, all the evidence proved it worked absolutely. Let me guide you into a secret that will completely change the way you look at life and will make everything possible. If used the right way there is nothing it can't accomplish. It is so powerful but yet so simple and peaceful at the same time that it has been overlooked or misunderstood ever since the beginning of the world. I will guide you into knowledge that will give you the true freedom and peace that we all seek but few of us ever find. The way this is explained is something totally new but yet something people always have been looking for. It is the reason people believe in god, practice religion and join secret societies and sects. It is why some of us seem to act totally insane and why so many of us chase money, fortune and fame. These people all have one thing in common, they are trying to find a place to rest and often without even knowing it they are all seeking for the truth. The truth is out there ready for you to discover. This eBook might very well shake the perspective that not only you but also a whole group of people, indeed an entire generation or society itself has on what life is all about. Also you will understand why this is the most important book in your life, yet at the same time the most unimportant and inessential book in your life. "I don't know how long it has taken you to write this book - but the depth it carries is amazing and is not to be taken lightly. and yet you have condensed your knowledge and presented it here in this wonderfully abundant report - this is indeed true sharing. Inside this report your reader will not find any bit of fluff whatsoever. Everything that's been mentioned in here is the most essential stuffs that can enlighten and empower your reader almost instantly - simple and profound stuff that works! I know because I too have been on the path for all my life and thus I can tell a gem when I see one. Your report bridges the wisdom between the East and the West. "This is an absolutely AWESOME read! Worth every penny of the purchase price. 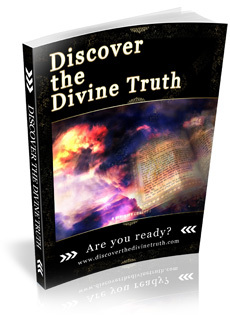 You really NEED to get 'Discover The Divine Truth' right now!" It reads like a beautiful unique ebook, that you only find once in your life, with illustrations that flourish your imagination and information with the potential to change your whole life. It is a wonderful 78 pages eBook, illustrated with beautiful artwork (14 images) by the Expos� 5 (the industry's most recognized digital art annual) featured artist Suirebit. This is a revolutionary e-book that enables anyone not only to see him/herself in a new way, it has the potential to change any hopeless situation. I highly recommend this for those who want to take charge over their lives. If you have lost control over your finances, your life, your career and over your marriage, all you do is to pick a copy of this great e-book so that you can discover the divine truth about your finances, life, career and over your marriage. And most importantly, it is simple and easy to understand, written in everyday English.[...]" "Thank you for writing such an inspiring ebook. I absolutely loved it. It was truly thought provoking and I couldn't put it down once I started. It was also unique and easily understood. I'd highly recommend it to anyone on the journey of self-discovery. You will learn more about it when reading Discover The Divine Truth. Mind, Body And Soul - Who Are You Really? So Why Does The Mountain Not Move Then? "I absolutely love this eBook. It instantly became one of my favourites while reading it. If you watched movies like The Matrix, What the Bleep Do We Know, The Secret or similair you MUST read this eBook." Also included as a bonus. One of the most fascinating conversations ever to have been recorded at an internet forum. The Insider reveals things about life, the divine law, the system we live in and how it all really works. This is a very controversial text and definitely NOT for everyone. Something fascinating happened on a forum in a span of a few days and it has caused quite a stir in certain parts of the Internet. First some questions are being asked by Insider like "Are you really living on the planet you think you are?" which made people react differently than before. Like one person observed, this was way over the heads of the usual suspects. Some people started getting upset, others were drawn to it and this all lead to a dialogue where so much was revealed, [...] that it can be studied for years to come. Sounds hard to believe? Read on. We need to point out that what is mentioned in these 2 ebooks should not be taken very easily and lightly. Please be aware that this is NOT easy stuff. What is written in these eBooks from certain viewpoints can be very challenging and extremely controversial for some people. Please be aware that reading Discover The Divine Truth could change your life while you are reading it. Yet it could also have no effect on you at all. We have been told that when understood, this eBook can have so much power that it can easily change the life of many, for the positive OR for the negative. The information given to you is not to be taken lightly and should be handled wisely. Parts of Discover the Divine Truth and Revelations of the Insider could be seen as very offending from the viewpoint of many religions. Revelations of the Insider is a real conversation from a real internet forum and contains "bad" language. you MUST read this eBook."